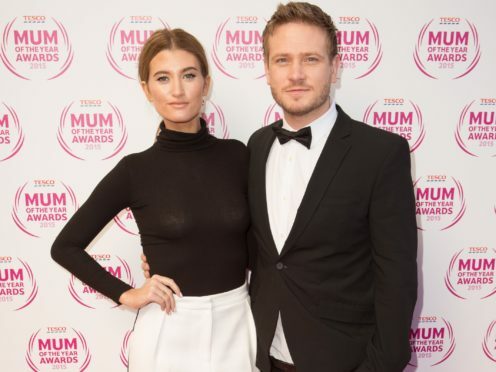 The soap stars, who have two sons called Buster and Bowie, recently announced they are expecting another child together. Wolfenden told OK! magazine: “We’ve always wanted a big family. It feels different this time as it feels like we’re going from a family to a gang. He said they told their children about the baby on Christmas Day when Webb was 11 weeks pregnant. “They had some joint presents and the final one was a teddy bear with a note attached, which read ‘please give this to your baby brother or sister when they arrive in July, love Santa’,” he said. Webb revealed her boys are excited ahead of the birth. The couple shared their baby news in February with a picture on Instagram of themselves and their sons walking in the woods. The boys held a sign that read “Buster Bowie and”, and the post was captioned “#Number3”. Webb, who plays Debbie Dingle in the ITV soap, started dating Wolfenden, who plays David Metcalfe, in 2007. They tied the knot in 2018. OK! magazine is out now.